As always these are original oil on canvas works and can be bought direct from Brenda. Jan 2008: Due to popular demand, "Irish Paint Magic" with David Willis is now showing on Monday evenings at 7.30pm on TG4. It is a "must see" painting programme of Irish Scenery, using the Bob Ross products and "Wet on Wet method of Oil Painting on Canvas. 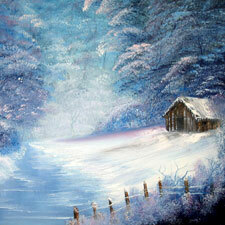 Brenda's Art Supplies is an agent for Bob Ross Artist Supplies in Ireland.